I Promise, I’ll Come Back! When I was a little girl, Dad often worked away from home. Sometimes he’d be gone for weeks at a time, but not once did we ever worry that he might not come home. We knew he’d come home because he told us he would. Once, when he was gone for a month, all of us kids slept on the floor in front of the living room door the night he was coming home, so that we’d see him the minute he walked in. I fell asleep staring at the windows. I was so anxious to see Dad’s face! Many years later, when Dad recalled that night, he had a different story. When he arrived, he came in through the kitchen door, walked past all of us asleep on the floor and woke Mom up. He asked her why we were all on the floor, and when she told him, he went out and came back in through the front door. Dad wouldn’t disappoint us. Because Dad always kept his word, and always came home, we never doubted him. Jesus also makes promises that He will keep. He promises that He’s coming back. I’m often asked, “Do you believe Jesus will return in your lifetime?” My answer: Absolutely! Why? Because Jesus told us to keep watch. If we are to keep watch, we must be watching for Someone! When Jesus says “Keep watch” I think it behooves us to be alert! As children, when we knew it was time for Dad to come home, we’d be on our best behavior. We’d obey and do everything Mom told us to do. We didn’t want Mom to give Dad a bad report. The reality that Dad was coming home changed our behavior. Does the reality that Jesus will return change your behavior? If you knew for a fact that Jesus was returning tonight, what would you do differently today? Do you know He’s not coming tonight? 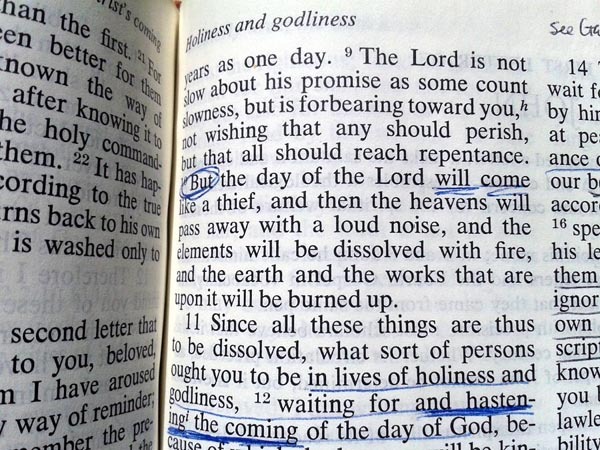 We know Jesus will return because He told us He will, and He always keeps His word. We don’t know when, so we must choose how we will live as we wait: in watchful anticipation, or scoffing. Which have you chosen? Marcia, I just joined your blog you are truly a gifted writer, your words bring tears to my eyes. I worked with Brian at Kraft, may GOD continue to bless you and your ministry. Loved this one, Marcia! You have been on my mind and heart as I lifted you and Brian up while you were w/ the g-kids..I was praying that God would lead Nikki and Dan right to the house He had for them, so I’m waiting eagerly to hear from you re: how that trip went! !